Medical marijuana advocates say that a proposal to allow epilepsy patients to use medicinal oils that contain a therapeutic component found in marijuana wouldn't do enough to help patients like Alexis Bortell, 9. Last year, a University of Texas/Texas Tribune Poll showed that 77 percent of Texans believed that marijuana should be legalized in at least some circumstances. The proposal by Klick and Eltife limits the presence of THC, the psychoactive element in marijuana, in the oils. It requires a CBD-THC ratio of 20:1. Klick said there will also be a loss of political support if her bill is expanded to include other ailments, such as cancer, Crohn's disease or Lou Gehrig's disease. The representative's interest in medical marijuana came after she met constituents in her district with children suffering from Dravet syndrome, a rare form of epilepsy that begins in infancy. "A number of children with this syndrome are very poorly controlled with their current medical regime," she said. "I spent months talking to physicians to see how we could help them and see how we could make this substance available." And Klick, who is supported by many Tea Party members, is among an increasing number of conservative politicians across the country who are warming up to medical marijuana. "Conservative states are likely feeling some pressure to medicalize, but they are also in stronger resistance," said Jeffrey Miron, director of economic studies at the Cato Institute and an economics professor at Harvard University. "As a result, they are passing relatively narrow, focused bills with limited access." Critics of the proposed Texas Compassionate Use Act don't think it goes far enough. They have concerns about the requirements the bill would put in place for patients, who would have to try two epilepsy medications at maximum dosage before trying CBD oils. In addition, they object to the bill's requirement that a patient may not try medical marijuana unless no other FDA-approved treatments are available. Finally, critics don't like how long the implementation of the measure would take, with the first dispensaries scheduled to be licensed by 2018. "If you look at some other states with CBD-only legislation, you will see that bad laws can be worse than no laws at all," said Shaun McAlister, the executive director of the Dallas-Forth Worth branch of the National Organization for the Reform of Marijuana Laws (NORML). "We need immediate access to whole-plant marijuana, not appeasement legislation." His colleague Tracy Ansley added: “We don't consider these medical marijuana bills. These are medical hemp bills." The organization believes that the low levels of THC allowed under the legislation would only relieve symptoms for an estimated 20 percent of the epilepsy patients it is intending to help. 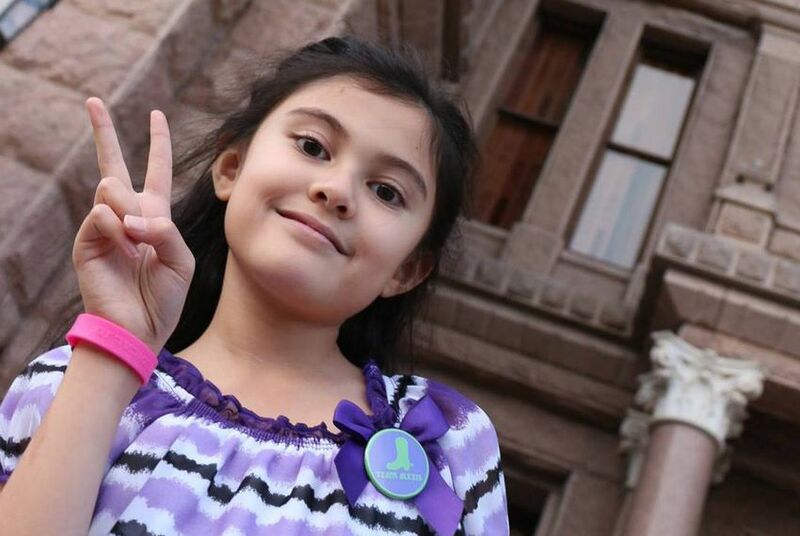 As the bill is written, it stands to lose the support of Alexis Bortell, whose story has made national news and struck an emotional chord in Texas. In 2013, when Alexis was 7, she had her first seizure in the family's home in Rowlett, near Dallas. Since then, doctors have struggled to find medication that would offer her relief. Dean said he and his wife, Analiza, were skeptical about medical marijuana before Alexis was diagnosed with epilepsy. But when they saw their daughter's first seizure, their feelings began to evolve. At the federal level, marijuana remains classified as a Schedule I substance, a status given to an element that is considered to be addictive and without confirmed potential for medical use. In 2009, however, President Obama urged federal prosecutors not to pursue those who have distributed marijuana in accordance with state law. Last year, then-Gov. Rick Perry indicated that marijuana control should be left to the states, saying that he supports decriminalization efforts in Texas. For more than a decade, veteran state Rep. Elliott Naishtat, D-Austin, has unsuccessfully attempted to pass a medical marijuana bill that would provide an affirmative defense for patients who use marijuana based on the recommendation of their doctors. The Texas Medical Association has made clear that it does not support legalizing marijuana for medical use. "There is no validated science to support its use in broad treatment," the association said in a statement. On Wednesday, Alexis had what her father described as “her worst seizure ever,” and she was rushed to the hospital. “We are seasoned parents, because we have seen a lot at this point,” Bortell said on Thursday. “But last night, we crossed a threshold. It would appear that the big ones are getting longer — they just don't happen very often. Now, the question is: How much time do we really have?"